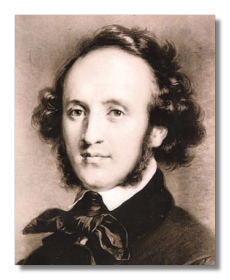 Mendelssohn's short life (February 3, 1809 - November 4, 1847) for the most part justified his name, Felix, which means "happy, lucky" and from which we get the word "felicitous." His life showed little of the storms that marked Beethoven's or the stresses of Berlioz's. Born into a wealthy banking family, the grandson of the great German Jewish Enlightenment philosopher, Moses Mendelssohn, Felix (later baptized Jacob Ludwig Felix) showed an early aptitude for music. Fortunately, he had parents willing to let him become a musician, and he received the finest training. His most prominent teacher was Carl Friedrich Zelter, advisor in matters musical to none other than Goethe. 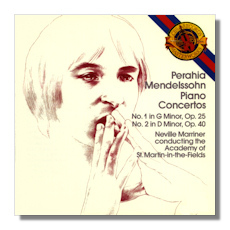 Zelter gave Mendelssohn thorough, but very conservative, instruction. 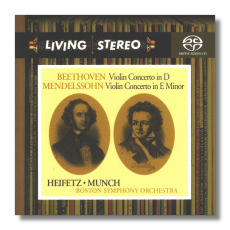 Mendelssohn was encouraged to follow Bach and Mozart, but not Beethoven. Nevertheless, the boy found out Beethoven for himself and formed a deep appreciation and love of Beethoven's final period, particularly the middle and late piano sonatas, much to Zelter's puzzlement. Mendelssohn's really early music (up to roughly 1824) is incredibly accomplished for a kid, but he began writing masterpieces around the age of 15, furthermore in an idiom largely of his own invention. Works of this period include the Harmoniemusik for band (1824), the Octet (1825), and the Overture to A Midsummer Night's Dream (1826). With these three pieces, he became one of the most important early Romantic composers. 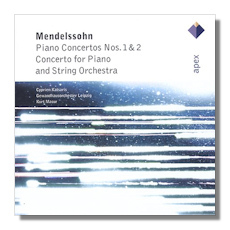 Mendelssohn's music blended Romantic sentiment and fantasy with a Mozartean economy, clarity, and poise. He became associated with a strand of composers that included Robert Schumann and reached its peak with Johannes Brahms. His exposure to Bach led to a fondness for learned counterpoint as well as to his conducting the St. Matthew Passion in 1829 – an immensely influential performance that took Bach out of the exclusive hands of specialists and into a more general public consciousness. He began to perform throughout Europe as a conductor and as a pianist to great success. In 1829, he made his first trip to England where his composing and playing found a rapturous audience. Indeed, one can say that Mendelssohn dominated English music in the 19th century as completely as Handel had done in the 18th. He made a tour of Scotland as well, where he began work on his Hebrides Overture (1832) and "Reformation" Symphony (1832). A tour of Italy inspired his "Italian" Symphony (1834), usually designated the Fourth Symphony, but actually written second. However, even a genius needs steady work. Mendelssohn found it in Düsseldorf in 1833 and became director of music for the city. His oversight of sacred music led to performances of large choral works by Handel and Haydn and to an interest in trying an oratorio himself. 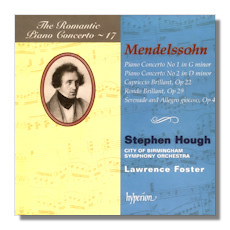 The result, St. Paul (1836), proved immensely popular and established Mendelssohn firmly in the forefront of contemporary composers. Although less popular today, it is still considered a milestone in the development of the genre. 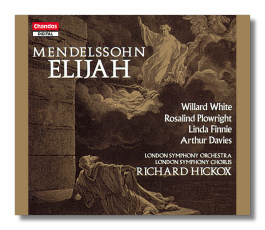 However, friction in Düsseldorf prompted Mendelssohn to look for other employment. The 1840s found him splitting his time between Berlin and, more importantly, Leipzig. Through his directorship of the Gewandhaus Orchestra and his establishment of a conservatory (1843), he quickly made Leipzig one of the major European musical centers, one which exerted significant influence throughout Europe and even the United States up to the early years of the Twentieth Century. He also continued to conduct, compose, and tour. Major works of this period include his String Quintet in B-flat (1845), the Violin Concerto in e-minor (1845), and the oratorio Elijah (1847), a rethinking in Romantic terms of the Handelian oratorio and one of the monuments of the choral repertoire. The amount of overwork as well as the death of his beloved sister Fanny led to a series of strokes and finally death at the age of 38. Among the works left incomplete, we find fragments of a third oratorio, Christus, which arguably could have become his greatest, and an opera, Die Lorelei. During his lifetime, Mendelssohn was regularly compared (with good reason) to Mozart. He won the championship of Robert Schumann. However, by the 1880s, his reputation, after such inflation, predictably began to sink. Wagner singled out Mendelssohn as an icon for decadence in his notorious essay "On Jewishness in Music." George Bernard Shaw, in a classic example of love-hate, made him the poster-boy for Victorian gentility. 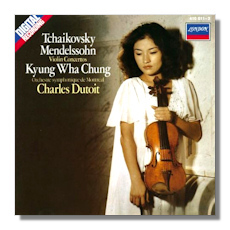 However, he praised the early music as that "of a very young composer astonishing the world by a musical style at once fascinating, original and perfectly new." In the Thirties the Nazis systematically tried to erase the composer from German music. The fact that Mendelssohn was baptized Protestant and that the family had converted in the 1820s (taking the name "Mendelssohn-Bartholdy," to distinguish themselves from all those lower-class Mendelssohns) made no difference, of course. Ironically, religion wasn't that big a deal to Mendelssohn himself. Despite his many sacred works, he generally approached the subject either as a practical musical matter or as drama. His conversion was more a matter of pleasing his father than anything else.